Everything is so much better in mini, right? Well cuter at least! Last week my cousin Leon came over to hang out and its become tradition that every time he comes over, I feed him. It’s become the unspoken rule. A lot of the time when I have people over I spend forever in the kitchen trying to finish off last minute dishes or making sure that all the food is the perfect temperature but this time I decided that I wanted to make something that wouldn’t be time consuming, something that I could literally russle up in a matter of minutes so that I had more time to spend with him… and just like that my spaghetti aglio e olio mini cups were born. These are so easy to make and fun for all ages, although since there are chillies in this recipe you may want to tone down the kick a little if your giving it to kids… or just leave out the chillies and and add cheese for the kid friendly version or just don’t feed the kids that night! Kidding guys, do that and I’ll report you to child services… kidding again! Oh also these are great if you’re trying to impress someone, even though this is one of the easiest things that I make, Jonathan loved the presentation, and judging by Instagram, you guys loved it too. So stop procrastinating and go make em! Take your garlic cloves and peel, then slice thinly lengthwise as evenly as possible. Heat up the olive oil in a skillet, on a medium-low heat and then add the garlic and chilli flakes, stirring occasionally until the garlic turns a pale golden color, roughly 7-8 minutes. Remove the skillet from the heat and stir in 2 teaspoons of grated fresh lemon zest and 1/4 tsp of salt. Meanwhile, preheat your oven to 400F and cook 1 lb of spaghetti until just al dente. When its done pour the garlic chilli oil mixture over the spaghetti , add a pinch of pepper and mix well. 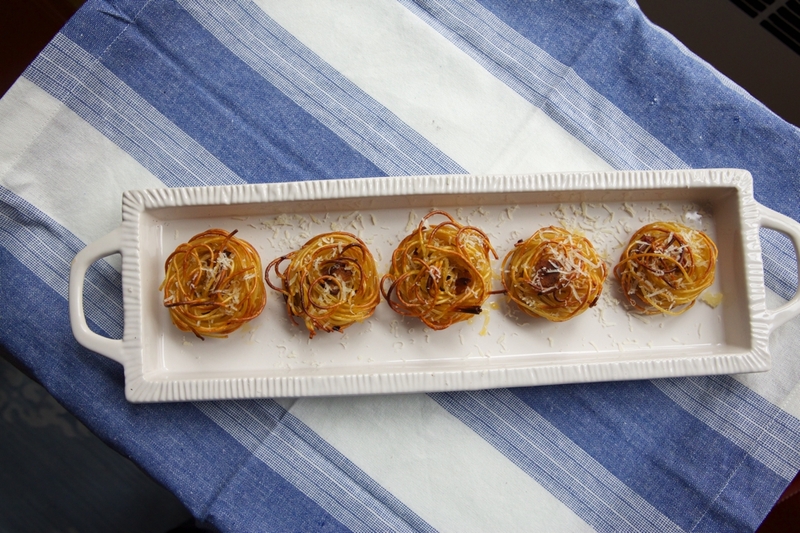 Oil two muffin tins and with a fork twist the pasta around it then transfer is to eat muffin cup. 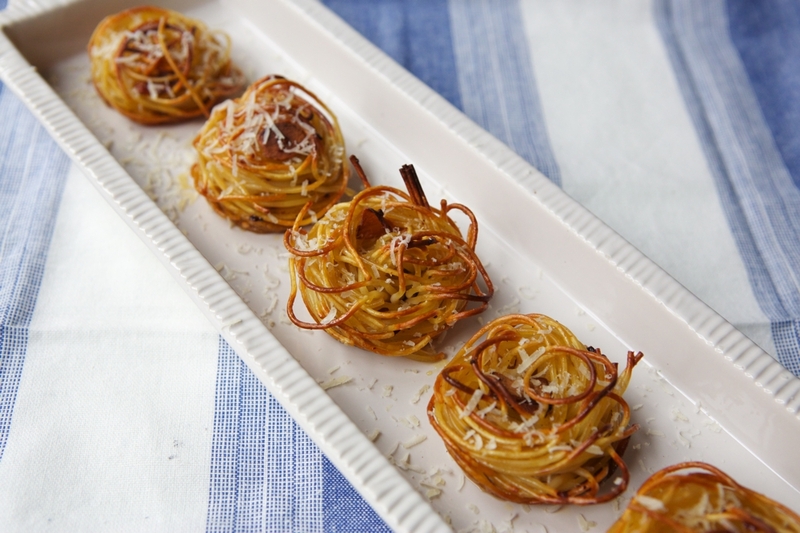 Bake for 25-30 minutes until the spaghetti cups look crunchy and golden. 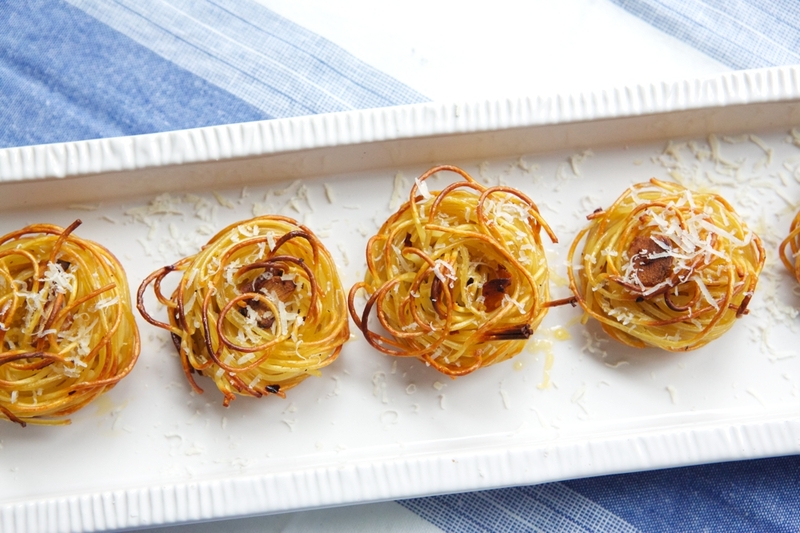 Take each spaghetti cup out of the tin and position onto your serving plate. Then top with grated pecorino. These look so good Julia! !